I was thrilled before rehearsal began this morning to sit down with Anita Rachvelishvili, who made a tremendous impression when she sang Carmen at La Scala in 2009 and at the Met last fall. A native of Tbilisi, Georgia, Ms. Rachvelishvili is making her Seattle Opera debut with this production, singing opera’s favorite femme fatale. We spoke about the opera scene in her native Georgia, her experiences singing Carmen on the world’s great stages, and some of the character’s psychological problems. 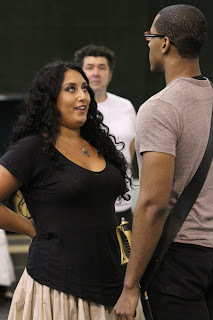 You’re new to Seattle Opera...welcome! First things first, can you help us with the proper pronunciation of your name and, while you’re at it, that of your hometown? Yes, my name is Anita Rachvelishvili (rotch-VELL-esh-VEEL-ee) and I was born in Tbilisi (tBEE-lee-see). And how did you first get involved in opera? When I was 17 years old, my father had the idea of sending me in for voice lessons because, when I was a girl, I always had this big voice and liked to sing all day long. I had studied the piano already, but he found a voice teacher and encouraged me to study voice. And I didn’t go along with it! Opera was a brand new world for me, and at first I didn’t like it. Had you ever been to an opera? No. I had heard Pavarotti on TV, that kind of thing, but I’d never been to an opera and I thought, “Oh, no, I don’t want to be an opera singer!” It was so unfamiliar. But I studied with this teacher for a year, and she told me my voice was perfect for opera, so I enrolled at the conservatory in Tbilisi. My teacher there was a mezzo soprano who sang with Tbilisi Opera, we had a wonderful relationship, but sadly she was sick with cancer, and after she passed away I continued my studies in Milan, at the Academy of La Scala. What was the best thing about your time there? I met my boyfriend there! He’s a tenor, he was in class with me, and we go together to the same teacher. Today our teacher is in Rome, and we still go there together, for lessons. Do many opera singers from Georgia go to Milan for their training? Yes, they all do. There are many fine Georgian singers. 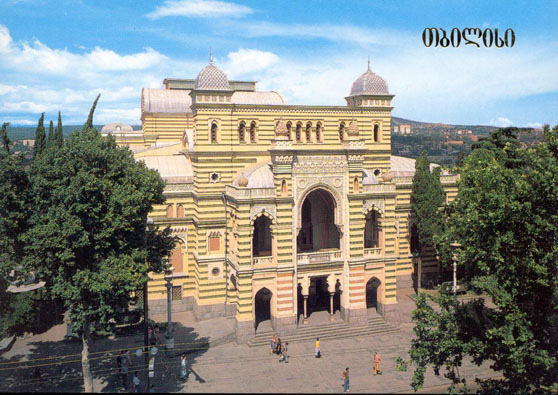 Tell us a little about the opera house in Tbilisi. It’s a beautiful antique theater, over a hundred years old. It’s closed right now, for remodeling. In fact, the biggest opera house in Georgia that's open today is in Batumi, on the Black Sea, it’s an old city but nowadays everything there is new. They have a beautiful, big new theater. And we have another opera theater in Kutaisi. Do they present operas in Georgian? Yes, we have lots of beautiful operas in Georgian. I hope to sing Georgian opera in Europe or America someday! Yes, we do a lot of Russian operas in the theaters in Georgia, as well as Italian, of course, and French. Not too many British operas—I love Purcell’s Dido and Aeneas, but haven’t yet had a chance to sing it. Well, Carmen, of course. And I love Dalila, and Charlotte in Werther. You’re doing well with these French operas! What about the Italians? Yes, I’ll be making my role debut as the Princess de Bouillon in Cilea’s Adriana Lecouvreur after I leave Seattle in November. We’re doing a concert, one performance only, at Carnegie Hall, with Angela Gheorghiu and Jonas Kaufmann, and the Opera Orchestra of New York conducted by Alberto Veronesi. As for other roles in Italian, I’m hoping someday to sing Amneris in Aida. But not yet! There’s an opera you’ll want to sing at La Scala. No, no! I must do it in a smaller theater first. What’s your favorite Russian role? I love The Tsar’s Bride by Rimsky-Korsakov, it’s really beautiful. I will sing Lyubasha in Berlin in a few years. No, it was molto tranquillo. Before I did Carmen at La Scala, I had six months of preparation with a woman who had coached Maria Callas. She was working with me on the role, the French text and the music, all the dialogue, even before my teacher taught me to sing it. And then working with Daniel Barenboim and with Emma Dante, who directed the opera at La Scala. So you couldn’t possibly have been more prepared. You know, when I see that performance now, I don’t much like it...it’s been two years, and I think I’m much better now, of course! But I’m happy because it was a really successful debut, and it was an important step in my career. And when you sang it at the Met? It was a curious story at the Met--there was a plan for another singer to do it, but she canceled when she became pregnant. She was to do it there and in Munich. And the Met had me signed up to sing it in 2012, but I was happy to do it early! 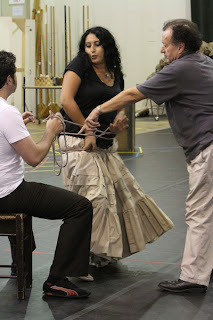 What’s the most challenging thing about performing Carmen? The first half of the opera, Act One and the first part of Act Two, is really a lyric mezzo soprano part. But the finale of Act Two and Acts Three & Four are more dramatic, because the character has changed. I like to sing dramatic parts, but it’s not so easy for me to sing the first part. 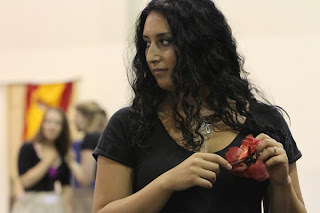 What, for you, is the most fun or enjoyable thing about performing Carmen? The Habanera. That’s where she has the most fun--and she is a very funny woman, she’s got lots of energy. And at the top of Act Two, where you have all these dancers treating you like a queen--who doesn’t love that? You get to be Cher, with all these dancers swirling around you. That’s a very fun part. And I love the Seguidilla, it’s so beautiful. And so is the final duet with José at the very end. Bernard Shaw once wrote that the appeal of Carmen lay in seeing a “respectable middle-class young lady...harmlessly pretending to be a wicked person.” Do you agree or disagree? But how intimate is she, really, with Frasquita and Mercédès, Dancäire and Remendado? Exactly. Everyone needs someone to talk to, to tell a friend what’s in your heart. Carmen doesn’t have such a person. She is alone, egoista (selfish). And extremely strong. It’s not easy to be like this. I can only imagine her strength. I have a family, my boyfriend, my friends...she has to go it alone. Does she miss an opportunity to make this kind of connection, with José or Escamillo? Yes, because it’s not in her nature. She wants to be free. Of course she wants to find “Mr. Right,” she’s a woman, we all do. Perhaps she sees a potential in José, but he isn’t that strong. He is too jealous and she doesn’t like it. She may want to see some other kind of man in him...but we know that it’s wrong to try to change another person. It doesn’t work. If you want to love someone, you have to love him as is. Yeah, honestly, does she ever really think she’s going to succeed in making a great bandit out of José? That he’ll just desert the army and become the kind of guy who will really excite her? Maybe she has this dream. But he’s never going to be that! Why not? She doesn’t give up on him. He does desert; she gets him to go with her. It’s true, that doesn’t make her happy, because in the end he’s not the person she wanted him to be. But...she made a mistake. Do you think she threw the flower at the wrong guy? I don’t know, maybe she should have thrown it at Zuniga!